This review is based off of 3 plays at Gen Con 2013 (6-7 player games). Yeah Mascarade! I thought this game was a heck of a lot of fun and I still smile when I think about it. My biggest regret of Gen Con 2013 is not purchasing the game – I tried, but the game was sold out (bye bye Usurpateur promo card ). Players start with 6 coins; First player to 13 coins wins. Each player is dealt 1 role card face-up. Players are given a few moments to note which player has which card. Then everyone flips their cards so they are now face-down. Players at the table may decide you are bluffing or lying or just plain wrong and challenge you. After all challenges are declared, you and all other challenging players flip their cards. Whoever was actually the declared role gets to take the declared action, and everyone else pays a 1 coin penalty to the Courthouse. You may declare “I am the Queen, and I use the Queen’s ability to take 2 coins from the supply.” Bob and Maria decide to challenge you. You, Bob, and Maria all flip your role cards face-up. You were not the Queen, so you pay a 1 coin penalty to the Courthouse. Bob was not the Queen, so he pays a 1 coin penalty to the Courthouse. Maria actually was the Queen, so she gets to take 2 coins from the supply (even though it wasn’t her turn!). If no one challenges you, you get to take the declared action and will not reveal your role card. The first 4 players to take actions MUST take the swap cards action. If you challenged the person who has the turn immediately before you, you MUST take the swap cards action on your turn. Masquerade! Run and hide, but a face will still pursue you. Oh, how fitting is this song for this game? So great. The cards are pretty. Players are laughing. And your friends are going to lie and deceive and occasionally come after your coins. Minus the costume ball aspect, the game mechanics support the theme in reverse (if you consider that people are the masks and the cards are the wearers in the analogy). The game gives you the feel that players are switching and swapping and you don’t know which role is lurking behind which face-down card. The roles are things you’d probably see people dressed at in costume parties – judges, beggars, bishops, etc. The cards have a sort of 1800s period feel. This game was selling for $25 USD at the Asmodee booth, though 10% off coupons were widely available. The Asmodee website lists a $30 MSRP. $20 - $30 USD seems reasonable for this small box game. The cards are not flimsy, the cardboard coins are sturdy, and the courthouse plaque is unlikely to bend. However, the cards were printed with a black border, which will likely be prone to scuffing and marking. You may wish to sleeve your cards. The game also comes with 5 role summary sheets, which is nice, but I wish there were more. I’m not going to say this is the most gorgeous game in the world because the cards and role tokens are too busy, but the art is quite nice. The color schemes are lush, the 1 5 and 10 coins are easy to distinguish, and the roles’ special abilities are clearly marked on the cards. I used the rulebook to teach the game to the other players on the spot, without having seen the rulebook before. The setup section was a little confusing regarding the changes that need to be made for the number of players, the mandatory starting swaps, and the rule that you must perform a swap if you issued a challenge to the player before you in turn order (for whatever reason, this rule was in the setup section). But when I picked up the rulebook later to explain the game to a different group, I had no problems finding the information I was looking for. This is a game that will inevitably raise some “what if” questions (ex: “What if someone issues a challenge to the Judge? Is the loser’s coin put in before or after the Judge takes the coins from the Courthouse?”). The rulebook was satisfactory in answering the questions that were raised during the 3 games I played. Teaching others the objective, the rules, and the role abilities was pretty quick and painless. I think this game’s weight is about 2.5. 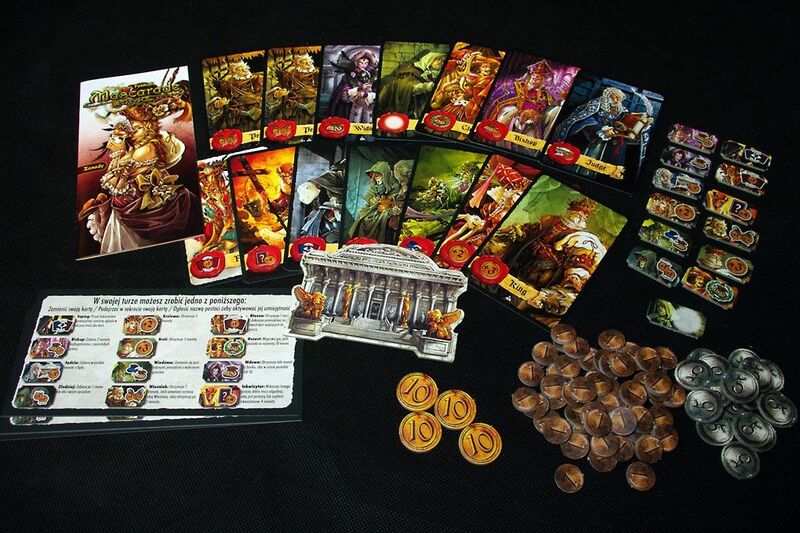 It is a game where you need to be thinking – you will try to use your memory and probability skills to guess which player has which card, you will have to constantly be aware of how close players are to the needed 13 coins and which roles will help them get there, and you will have to keep track of your own coin pile and try to figure out which role you should try to acquire to get you to 13 coins. Sometimes players will take actions that will change your decisions before it is your turn, and then you will have to think about how to adjust. Generally this game doesn’t seem to feature that much luck. You will sometimes have to make 50-50 guesses (was a swap performed or merely faked?). However, since most swapping decisions will be strategic rather than random, you should be able to apply reason to these situations. High! There will be discussion, suggestions, stealing, swapping, bluffing, and mischief. Reasonable. Each player can only take 1 of 3 actions, and the time period for declaring challenges is limited to a couple of seconds, so the game moves along. I haven’t played this game with a large group though; wait times may be more lengthy when there are more players. The box says the expected game time is 30 minutes. I think each game I played has been about that long. This game is fun! I totally want to play it again! The setup is flexible – I think you have to include the Judge in every game but other than that, all role combinations are allowed. There are also 2 roles available through promos to increase the number of roleset combinations. Each role has its own special benefit and I know I’m looking forward to experimenting more with different strategies. 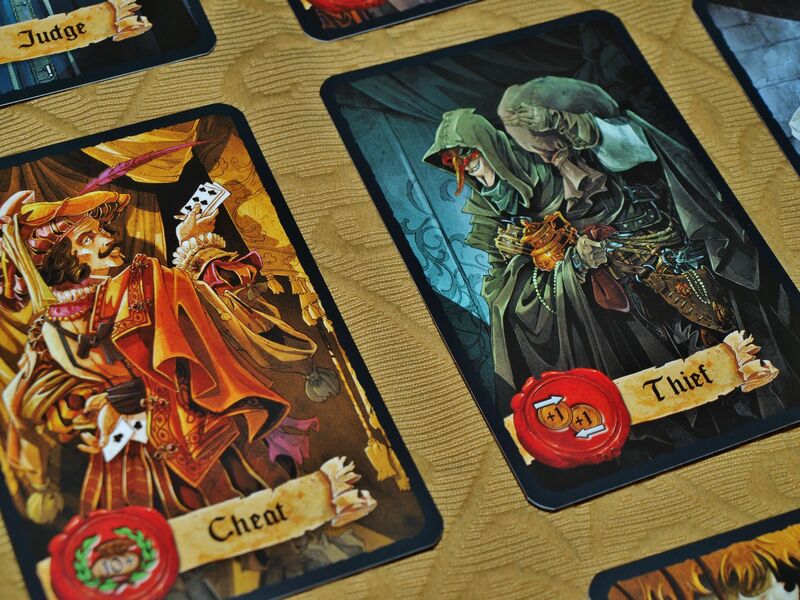 You will inevitably hear many people comparing this game to Citadels, also designed by Bruno Faidutti. - This is a full game in of itself – not a filler. Don’t let the small box deceive you. - If you enjoy bluffing, you will probably like this game. - If you are looking for a strategy game that can accommodate a large number of players or a wide range of number of players, you will probably like this game (plays 2-13). - If you have an absolutely terrible memory or tend to space out at the game table, you probably won’t like this game. I was lucky enough get my copy from amazon (arts games i believe) with the Usurpateur promo card! (Although my card says "Usurper"). Cool thing though is that the game comes with the beggar card which has no text on it so you could just use that card for Usurper. I find this game has a lot more in common with Coup then Citadels. I just ordered it on Amazon for Art's Games as well. Do you know if all the copies they have come with the promo? So my copy came today from Amazon (Art's games) and yes it did have the Usurper promo card in it's own ziplock bag attached to the game itself. In other words if you don't have the game yet you should order it there because two of us have gotten the promo with our games now. I also got the Usurpateur promo card by ordering from Amazon (Art's games). Canadian here. I just got mine from Snakes and Lattes webstore. It came with the usurper card. I purchased this on Amazon this week and it came with the promo card. Was I just luck? I don't know, but I am happy!